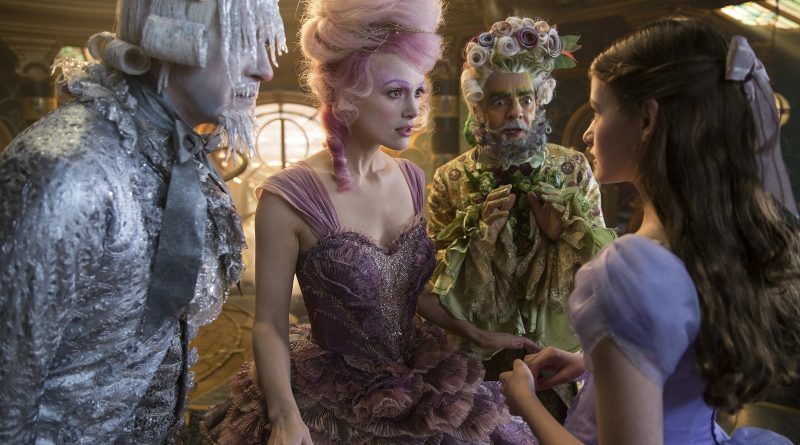 The pacing and tone occasionally get as clunky as an old-fashioned windup toy, but Disney’s live-action movie adaptation The Nutcracker and the Four Realms boasts kaleidoscopic costume designs, whimsical fantasy lands and a clever heroine worth cheering on her journey of self-discovery. A delightful but overstuffed holiday feast for the eyes and ears, the film version of the beloved ballet also features pop culture phenomenon Misty Copeland, the first African-American female principal dancer for the prestigious American Ballet Theatre. Never underestimate the magnetism of Misty Copeland, especially when she is en pointe. First-time screenwriter Ashleigh Powell (who joined the screenwriting ranks in 2012 when she sold her dystopian thriller Somacell to Warner Bros.) draws from both German author E.T.A. Hoffmann’s 1816 story The Nutcracker and the Mouse King and the ballet it inspired, originally choreographed by Marius Petipa and Lev Ivanov with the iconic score by Pyotr Tchaikovsky. Eight-time Oscar-nominated composer James Newton Howard seamlessly incorporates the familiar music. The story centers on scientific-minded teenager Clara (Mackenzie Foy), who is mourning the death of her mother, Marie. (Really, Disney? Another dead mom?) On Christmas Eve, her prim and proper father (Matthew Macfadyen) presents Clara and her two siblings with special gifts their mother picked out before she died. Clara’s is a beautifully engraved golden egg, with a note that “everything you need is inside,” but it’s locked and there’s no key. The girl notices that it is embossed with the mark of her godfather, oddball artist and inventor Drosselmeyer (Morgan Freeman), and resolves to ask him about the missing key at his famed Christmas party that night. When the children begin the annual treasure hunt for their gifts, Clara follows a golden cord into the deep recesses of Drosselmeyer’s mansion – and right out a felled, hollow tree into a magical winter wonderland. She finds the key, but it is almost immediately stolen by mouse, and while chasing the rodent, Clara encounters a stalwart nutcracker soldier named Capt. Phillip Hoffman (Jayden Fowora-Knight, who doesn’t exude enough charisma for the title role). Clara quickly learns that her mother was the queen that brought this magical land to life, and in her absence, its four realms have fallen into conflict, with Mother Ginger (Helen Mirren, who makes everything she’s in better), the regent of the Land of Amusements, at war with saccharine Sugar Plum (Keira Knightley, whose breathy vocal affectations pain the ears), the regent of the Land of Sweets; stoic Shiver (an underused Richard E. Grant), leader of the Land of Snowflakes; and flamboyant Hawthorne (Eugenio Derbez, overdoing it), ruler of the Land of Flowers. After joyously welcoming Clara, the three allied regents plead with her to help them, but things aren’t quite what they seem in this magical land (unless you’ve seen more than a dozen movies in your life, and then they’re pretty much just what they seem). Like recent Disney live-action adventures like 2013 Oz the Great and Powerful and this year’s A Wrinkle in Time, The Nutcracker is visually gorgeous and entertaining enough, with some interesting approaches to adapting familiar material, but the results don’t quite cook up as well as you’d like, especially considering the first-rate ingredients. The Nutcracker is credited to two directors with divergent styles and sensibilities — Lasse Hallström (Chocolat, What’s Eating Gilbert Grape?) and Joe Johnston (Captain America: The First Avenger, The Rocketeer) – which may account for the uneven tone and pacing. In keeping with its ballet background, the movie exudes a more theatrical vibe than many family-friendly action-adventures. The film is at its most enchanting when it features Copeland in an extended and exquisite dance sequence in which she helps Clara learn about the history of her mother’s secret kingdom.